An extremely raw, brutal, and heavy album. The production is rougher than Devin's usual, but still has his trademark layering. 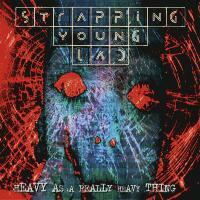 This is probably the most "industrial" of all the Strapping Young Lad albums, due in large part to the drum production, which gives the album a mechanical feel. The record loses some steam in the latter half but is, for the most part, engaging and interesting all the way through. Even though Devin himself has largely dismissed this album since its release, I think it's an absolutely superb record. While this isn't as good as Strapping Young Lad's later records, it is still fairly entertaining to see where their later sound originated from. This is also my least favourite SYL album, but that's cause i love the others so much! This is still a very strong album, having it's own unique feel differing from the latter releases. Probably my least favourite SYL album, but it still has very memorable moments and quirky parts that I love about the band.